Fujitori is an awesome Yakitori (grilled things on sticks) that has a great authentic Japanese feel and the food is so good. Probably the best yakitori I have experienced so far since I have been in Japan, and I have eaten A LOT. I just love it! I was recommended this place by a friend because usually I go to Kushidori, which is a large chain. Kushidori is good and there are lots of them all over Sapporo so they are very convenient, reasonable and the food is good. But, I wanted to try somewhere new and so decided to try out Fujitori. My Japanese friends later told me that this place was very popular in Sapporo and they were envious when I told them that I had been there. After speaking to them, they all went too! So as you can guess it was packed, always a good sign. Luckily we didn’t have to wait to be seated but had to sit right next to the entrance way, so we received a short, cold wind blast every 15 minutes. The tebasaki (chicken wings) are awesome. They serve them to you de-boned on the stick, yep that’s right, so you don’t have to get your pretty little manicured finger nails dirty with meat juice. “benri da!” (convenient) said my friend. 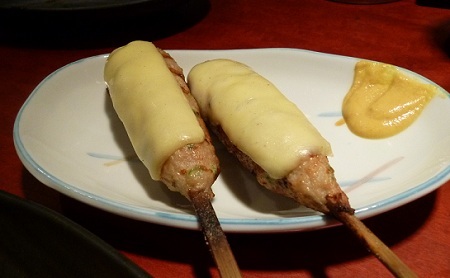 Another one of my favourites is cheesu tsukene (minced chicken with cheese). I order this every time I go to a yakitori restaurant. This was really good, lots of meat and very succulent and juicy. It just fell off the stick. Yum Yum. The one at Kushidori has melted cheese INSIDE! The staff at Fujitori are amazing too. They hung up our coats and gave my friend a free lighter. One guy heard us from the other end of the bar when we were talking about getting another beer, and brought them over before we even ordered. Their ears are always on the hear-out. Top quality service for no tips. Only in Japan. 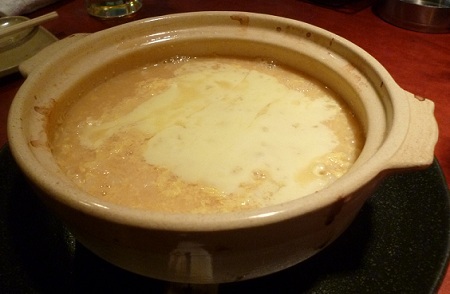 At the end we topped it all off with a miso and cheese Zosui (a porridge like dish of rice cooked with miso soup and topped with melted cheese in a hot pot). Zosui is rice cooked with the remaining soup of nabemono (hot pot) which is eaten after the meal, later on when you start to feel hungry again. It doesn’t look like much, but it is soooo good, very rich and sloppy and made me feel warm inside, perfect for those cold winters in Sapporo. Fujitori is found on the ground floor, down a side road between South 4, West 5 and South 4, West 6. Oh no ! This place has closed down.boo! I've never had an issue here with the lack of Japanese. I always come here with my non-Japanese friends and they are always very accommodating. I guess it depends who greets you when you enter. But, the food is awesome. When we walked in, we asked if there was an English menu and they said no English. That was fine as we thought we could just point to things on the menu to order. They wouldn't seat us and did a cross symbol with both arms and said Japanese only. It was the most rude experience if dining. Thanks for the recommendation! From the previous comment, I was afraid to try Fujitori because we are also Americans with no knowledge of Japanese. I figured if we're turned away, we'll just try somewhere nearby since it's a very centrally located establishment. The staff couldn't have been friendlier to us. They even have an English menu so we could just point and put up the number of fingers for how many dishes we wanted. The food was delicious and we were treated very well. Reading the comments I wanted to try this place. However when I tried to enter the establishment I was asked if I spoke Japanese. Since I do not I was promptly shown the door. In my several trips to Japan I've never felt insulted and discriminated against for not speaking Japanese. This was the first time that I was truly offended by that. 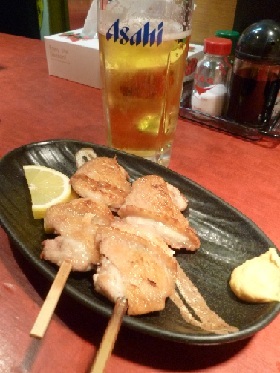 If looking for a yakatori place, the establishment nearly across the street is delicious and English friendly. I will never try to eat at this establishment again. The food here is awesome and in a good location. You have to go down an alleyway to find it though. I highly recommend the Tsukene too. Delicious! I stumbled along this place a couple of years back when I visited Sapporo. Love the food. Went there about three times in a week.